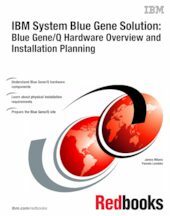 This document is one of a series of IBM® Redbooks® written specifically for the IBM System Blue Gene® supercomputer, IBM Blue Gene/Q®. Blue Gene/Q is the third generation of massively parallel supercomputers from IBM in the Blue Gene series. This document provides an overview of components that comprise a Blue Gene/Q system. It helps System Planners and Customer Engineers plan for the installation of the Blue Gene/Q system. Information is provided about the physical requirements for the machine room where the Blue Gene/Q system is to be located. Examples of these requirements include floor (weight and cutouts), cooling, and electrical specifications.